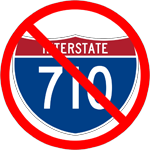 TONIGHT – 710 Tunnel Technical Study Community Meeting | YORK BLVD. The SR-710 Tunnel Technical Study Team has recently completed the DRAFT Geotechnical Summary Report. The report has found that tunneling is feasible in Zone 2 (Highland Park) from a geotechnical standpoint. This Community meeting is scheduled to share the outcome of field exploration work conducted as part of the Study. A presentation on information contained in the DRAFT REPORT will summarize the geology, faulting, seismicity, material properties, hazardous materials and groundwater conditions within Zone 2. Highland Park Residents, We demand you presence at this meeting in protest of tunneling under our community.